Would YOU Like to Sponsor this Tutorial - Please Check PR Page for details! Iam glad to have got back to posting tutorial. Please feel free to leave your feedback in comments so that it will help in iron out flaws if any and also make it better in future and also would motivate me to do share more of pattern drafting expeditions. In case if you any doubts, please raise the same and i would be glad to sort them out. Today we shall see part I of Angrakha Tutorial. This would involve drafting the Angrakha part. 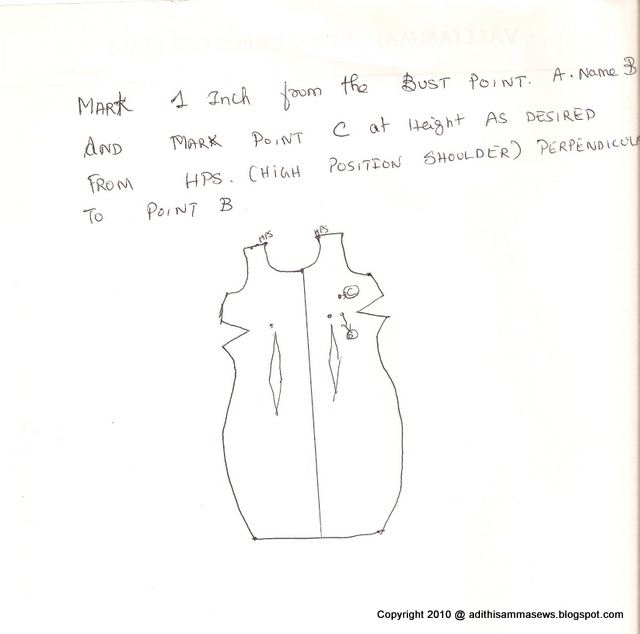 STEP 3: Mark 1 Inch from Bust Point (Approximately, depends on how curvy you are i am size 34 and it suits fine with me, increase or decrease 1 inch as required) from the Bust Point. Name it as B. 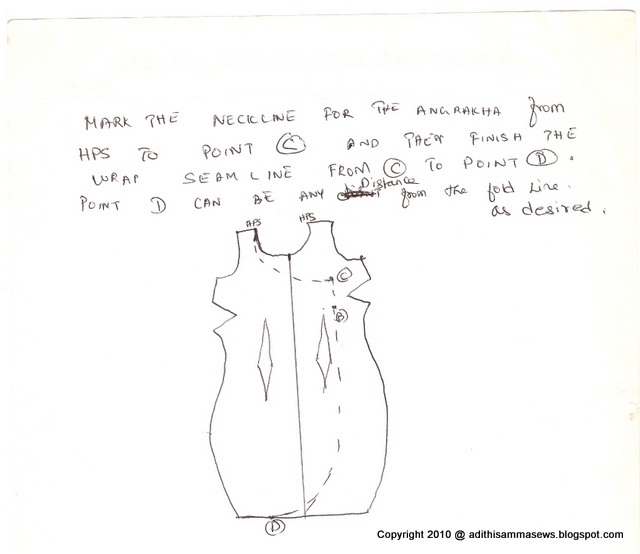 STEP 4: Draw the neckline for the angrakha from HPS to Point C and then finish the wrap seamline from C , crossing through point B upto Point D.
Step 5: To get the flared effect as the case is with the Angrakha i drafted for my sister, follow the steps 5, 6 & 7 or else you can retain the draft got from Step 4 as the Angrakha draft. Step 7: Retrace the spread out pattern all through. 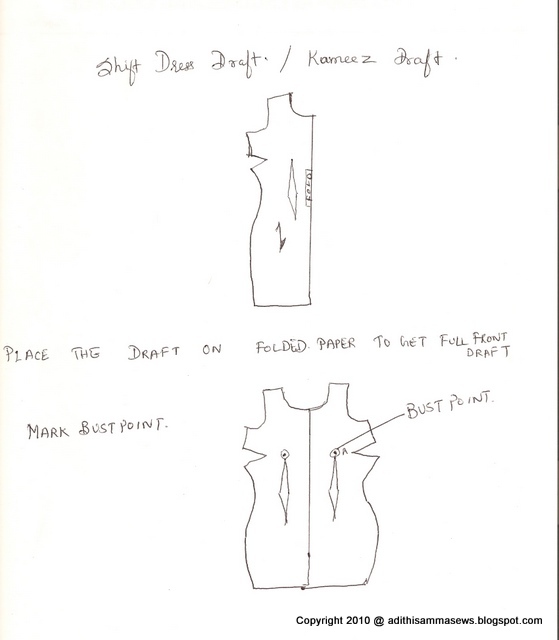 Now that we have the draft ready, how to integrate it with base draft and sew the same with ties will be dealt with in Part II, which i promise to post next week. So please draft the same and keep it ready. I'm so excited about this tutorial! I plan to make myself some tops once I finish sewing fall clothes for my daughter. What type of fabric did you use? I am glad u liked the tutorial. Will be more clear when i post the part II of the tute next week. Any free flowing fabric will suit this style of outfit. I had used crushed georgette in both of my Angrakhas so far. Hi, I am happy with the tutorial. One thing I want to get cleared... Do you cut the angrakha part on bias? Glad you liked the tutorial. Bias is not required. You can cut the angrakha part on straight grain itself. Since we have splash and spread and the flare is only from wasit downwards, it will flow and drape fine. Making it on Bias may prove wrong if the fabric stretches too much as remember we have to attach ties and the pressure will fall on areas where it is tied. You make this look so easy, I want to make one for myself now. Hi I like the pattern! stylish look. Can you pls tell how to sew the border over the slanting side of the neck. 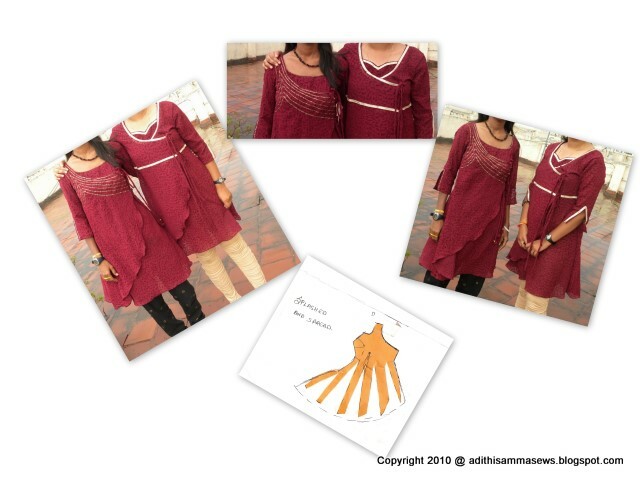 I am planning to sew the same style in mangalgiri cotton and i don want to through the border. Thanks in advance. love your tut! Hope to find a shift pattern to try it out soon. Thanks a bunch. I would like to contact you. Please contact me through this mail id at the earliest. I wonder how do i contact an anonymous person without displaying any id. Please check my profile and mail me in case you would like to contact me. May i know what is it regarding? hi...its very useful 4 me....tnx a lot.. Thanks Pratheksha. I hope my tutorials are clear and useful. 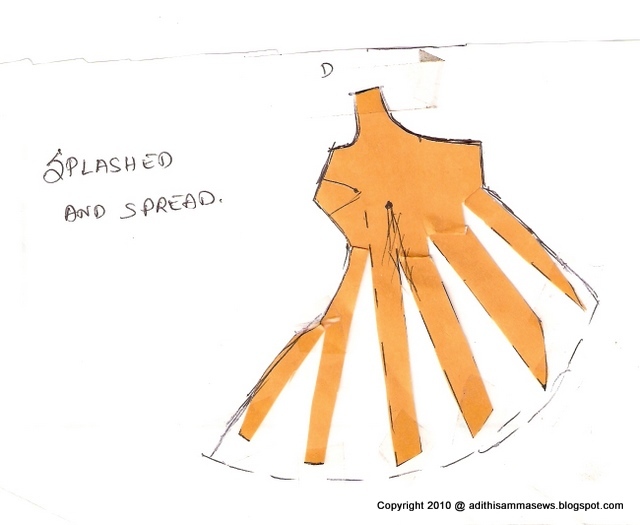 Will try to post fish cut skirt draft soon. Please refer my to Shelfari Bookshelf on my sidebar to know the pattern making books i read and use. 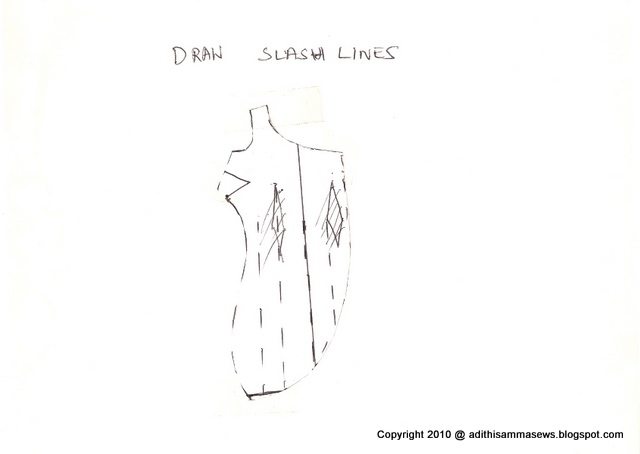 I am new to Bangalore and I am wondering where I can find pattern drafting paper (preferably on a roll). Newspaper is fine for smaller silhouettes, but not too practical if you want to create something with a lot of drape and volume. Do let me know if you have an idea...Thanks!! 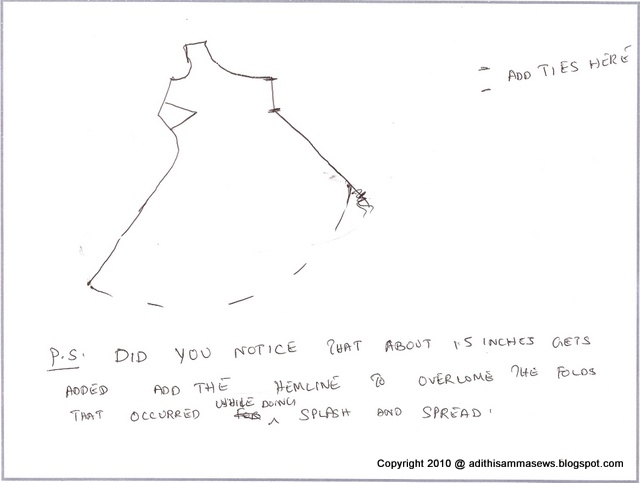 Regarding Pattern Drafting paper, i am searching for that in chennai too. i guess i can't give much info on that for you. If you happen to get some info on this, please pass it on to me. Thank you for your reply...I might order from China :(. I heard that the drafting paper that architects use is similar, I believe its called Gateway. I have yet to go look for this though. Thanks this is a great-looking pattern. By the way- I use doctor's office paper- the stuff you sit on and comes in rolls. j'aimerai profiter de ce modèle masi je ne sais pas comment faire, merci de votre aide. September - Sew Skirts All Month long! Images Posted here Belong to Me. All Rights Reserved. Copyright 2013 @ adithisammasews. Powered by Blogger.